Roasted carrot, parsnip, butternut squash and red onion combined with red cabbage and beetroot cooked with red wine and spices and Bramley apple, encased in a thyme and black pepper shortcrust pastry and garnished with toasted pumpkin seeds. 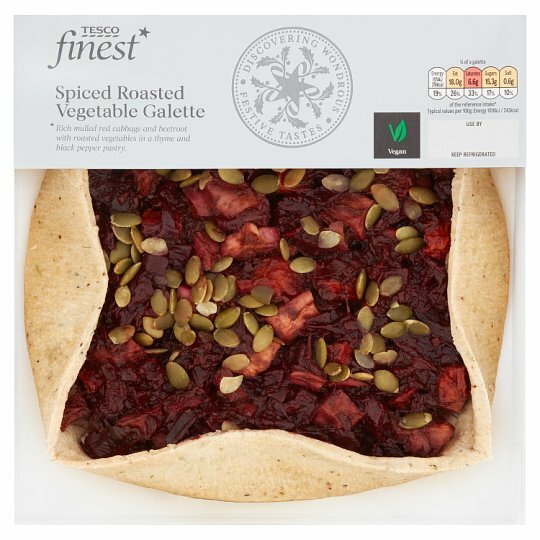 Rich mulled red cabbage and beetroot with roasted vegetables in a thyme and black pepper pastry. Our rich red cabbage and beetroot are slowly braised with allspice and orange zest to add sweetness and combined with roasted chunks of carrot, parsnip, squash and red onion, and Bramley apple. Our experts have combined this rich filling with thyme and black pepper pastry and hand finished it with a sprinkle of toasted pumpkin seeds. INGREDIENTS: Roasted Vegetables (36%) [Red Onion, Parsnip, Carrot, Butternut Squash, Rapeseed Oil], Wheat Flour [Wheat Flour, Calcium Carbonate, Iron, Niacin, Thiamin], Red Cabbage (9%), Beetroot (9%), Palm Oil, Maize Flour, Red Onion, White Wine Vinegar, Rapeseed Oil, Demerara Sugar, Balsamic Vinegar [Wine Vinegar, Grape Must Concentrate], Bramley Apple, Toasted Pumpkin Seeds, Cornflour, Red Wine (0.5%), Orange Zest, Garlic Purée, Salt, Lemon Zest, Black Pepper, Cassia, Allspice, Thyme.